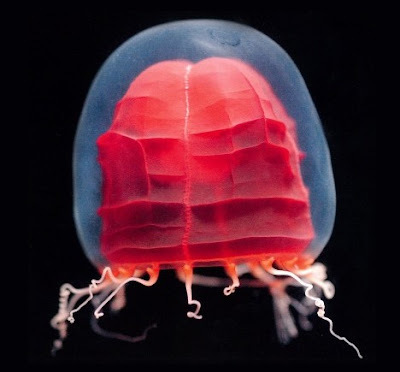 Not to be outdone by the piglet squid, here’s one that’s maybe even better: the red paper lantern medusa. Depending on who’s doing the talking, she’s also known as the aka-chochin kurage or the Pandea rubra. And the other wonders of the sea apparently love her enough that they’ll sublease her. There’s a video of all this wonderment at Pink Tentacle. Looks a lot like Blinky. Thanks for the cool photo AND reminding me of a cool Pixies song I hadn't thought of in years. George: No problem. It's my new thing: Blogging about strange sea animals and titling the post to reference a Pixies song. Really, there's a surprising lot of Pixies songs that reference the ocean. I had not noticed this until recently. And Rustie: Blinky the three-eyed fish? Looks kind of like a Metroid to me. Yeah, actually it does, now that you mentioned it. Apparently it's more friendly.